This book provides an exciting, accessible and wide-ranging guide to the development of classical and contemporary Durkheimian thought. Jonathan Fish offers a re-reading of the writings of Emile Durkheim and Talcott Parsons on religion. He aims to move beyond rationalistic readings which have neglected the key significance of collective human emotion in Durkheim's accounts of the link between society, religion and morality. He goes on to look at the development of these ideas in the work of Parsons and more recent Durkheimian thinkers. 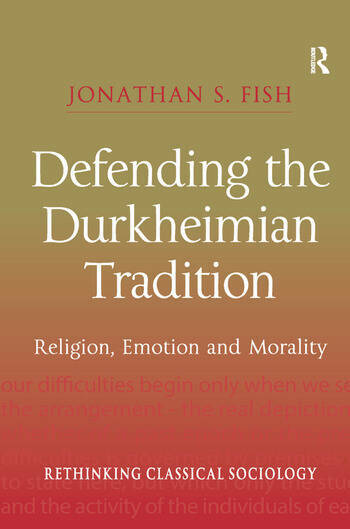 Making an important contribution both to studies of Durkheim and the Durkheimian tradition and to the sociology of emotion, the book is distinctive in arguing that religion is an essential backdrop for understanding emotion. In making this claim the author provides a key to re-establishing links between the sociology of religion and the wider discipline of sociology. Contents: Setting the scene; Ã‰mile Durkheim's The Elementary Forms of Religious Life; Ã‰mile Durkheim's lectures on Moral Education; Ã‰mile Durkheim's lectures on Professional Ethics and Civic Morals; Ã‰mile Durkheim's The Division of Labour in Society and The Two Laws of Penal Evolution; Talcott Parsons's The Structure of Social Action; Talcott Parsons's post-war writings on religion; Jean Baudrillard's 'implosive' critique of the Durkheimian tradition; Stjepan MeÅ¡trovic's and Michel Maffesoli's 'implosive' defence of the Durkheimian tradition; Conclusion; Bibliography; Index. Jonathan Fish is at the School of Sociology and Social Policy at the University of Leeds, UK.